Let’s get this out in the air - are people just high? Seriously, China exports up 50%? Not only what are they smoking, but what are the people who believe this crap smoking? And if you are just plain old gullible enough to believe that it’s true, why would anyone consider that type of move a good thing? I’ll come back to that, first let’s deal with the high frequency computerized debt addicts over here who were buying stocks yesterday. Equities are down hard from their highs this morning on the Retail Sales report. Bonds are up, the dollar is up, Euro down, oil down sharply, and gold up. Sound familiar? Well guess what… yesterday the computers all got on the same side of the trade again and produced a 97.6% volume up day on the NYSE. For those keeping score, it’s now 90%+ down days 8, and up days 5 since mid-April! Lucky 13. Will we get 14 as the computers all get on the same side today? Folks, you’ve been warned and I know you’re listening because this is proof positive that not only are you out of the market, but all your friends and family are too. This “market” is nothing but very few players all chasing one another with computers, there are no “investors” left. This is an extremely dangerous thing, and it is far worse than it has ever been – EVER. Everyone with two or more neurons left that can still develop a spark are long gone. Those who get on television and talk up this “market” either don’t meet the requirements of the previous sentence or they are trying to steal your money from you, plain and simple. So the “experts” expecting .4% growth receive a report that says retail sales fell 1.2% in May. Remember, this is way exaggerated on the up side because it only measures sales at stores that are open and does not account for the lack of sales at stores that have closed. Would that be hard to account for? No. How about simply totaling sales? Is that too difficult, addition? And even then you need to realize that you are adding up DOLLARS, not products. This type of self-deception has got to stop. It looks like the consumer paused the spending spree in May. But on average, sales have been healthy over the past few months. Overall retail sales in May fell 1.2 percent after gaining 0.6 percent in April and jumping 2.1 percent in March. May came in far lower than analysts' expectations for a 0.4 percent increase. Autos were only part of the decline as sales ex autos decreased 1.1 percent after gaining 0.6 percent in April. Sales excluding autos and gasoline posted a 0.8 percent drop, following a 0.6 percent boost in April. It this latter measure, weakness was mainly in building materials & garden supplies. Excluding autos, building materials, and gasoline, sales edged up 0.1 percent in May after decreasing 0.2 percent in April. The bottom line still is that consumer spending has been healthy on average over the last several months. Some offset should not be a surprise after a strong burst of activity. But the 1.7 percent decline in auto sales in the retail sales report actually somewhat surprising given that unit new motor vehicle sales were up 3.8 percent for the month. But weakness could have been in used cars, parts, or in price. The drop in sales for overall sales in May was centered in a 9.3 percent plunge in building materials. This was the largest fall for this component since the start of the series over 18 years ago. However, this component jumped 8.1 percent in March and 8.4 percent in April. So, the decline in May is not terrible in context. Other notable weakness in May was in gasoline, down 3.3 percent, and in clothing, down 1.3 percent. The drop in gasoline sales almost certainly was price related and the same may be true for clothing. 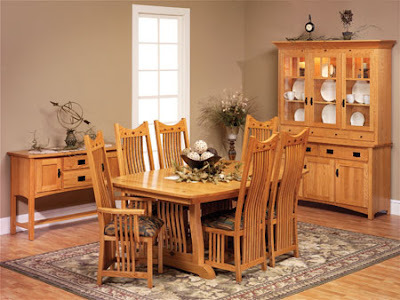 On the positive side were nonstore retailers, up 2.0 percent; furniture & home furnishings, up 1.0 percent; miscellaneous store retailers, up 0.9 percent; electronics, up 0.6 percent; sporting goods, etc., up 0.4 percent; food & beverage, up 0.3 percent; and food services & drinking places, up 0.1 percent. Overall retail sales on a year-ago basis in May came in at 6.9 percent and compared to 9.0 percent the month before. Excluding motor vehicles, the year-on-year rate slipped to 6.1 percent from 7.8 percent in April. Today's numbers clearly were disappointing and equity futures declined on the news-and Treasury yields slipped. But looking ahead, the PCEs component in the personal income report likely will not be as bad with it based on better auto numbers. And it should be much better in real terms. Ahh, are they kidding? They point out the trend right there, 2.1%, .6%, -1.2%... ahh what comes next in that series? Oh yeah, everything will chug right along fine with all the stimulus removed and the world still saturated in debt. Did you catch the largest drop EVER for building materials? Down 9.3% in one month?? Weren’t Cramer and fellow single neuron pumpers just shouting to buy Home Depot and Lowes? Keep smoking that stuff, it must be good. Citizen Sentiment and Inventories are reported this morning at 10 Eastern. A rumor that China’s exports rose 50% compared to last May drove China’s markets up over 2% at the close of trading. It turns out that the numbers were correct. According to Reuters, most experts expected the increase to be closer to 30%. The news shows the growing strength of the US economy. China exports to the EU are hardly likely to be rising quickly because of region’s lagging GDP growth and high unemployment. China’s rising exports will likely increase the debate over the value of the yuan, particularly if US government reports do not show a sharp increase in American exports. China, the Administration will argue again, does as well as its does in selling its manufactured goods around the world because it has a currency edge along with low labor costs. 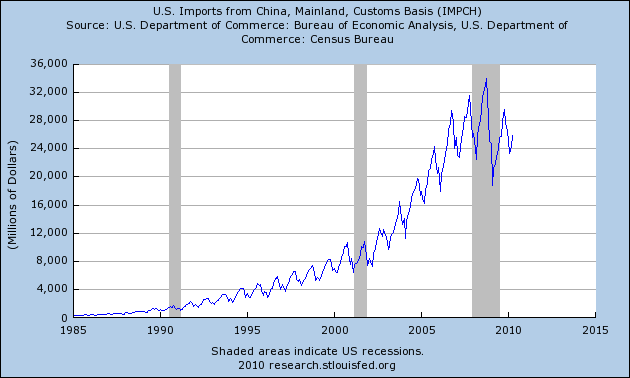 So, the 50% growth in China exports are due to strength in the U.S.? LOL, are they kidding? Is there really anyone on this planet who believes that? Do they realize that if it were true, that means exports are more than doubling every two years? Is that rate sustainable? And I haven’t even asked if it’s based on currency distortions or on flat out lies. I place my bets on flat out lies. Umm, 20% does NOT equal 50%. And we’re supposedly the strength of the report? If that’s so, then it should be up more like 100%! 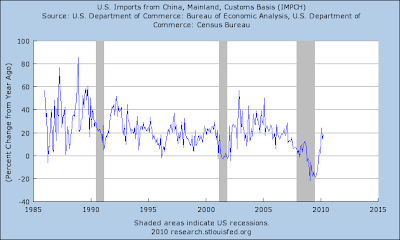 Here’s the math from these charts – Our imports from China are DOWN 23.5% from peak. They are up 36.8% from the low point. What they are not is up anywhere near 50% in any single reporting period. Frankly, the swings that are there are scary enough. 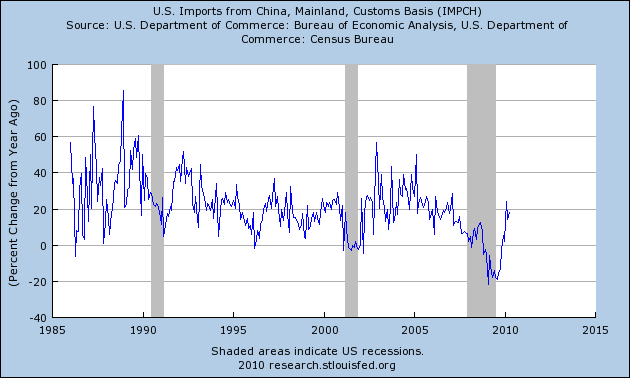 So, if China is exporting at the claimed pace, where are they exporting to? Yet another confidence destroying lie. 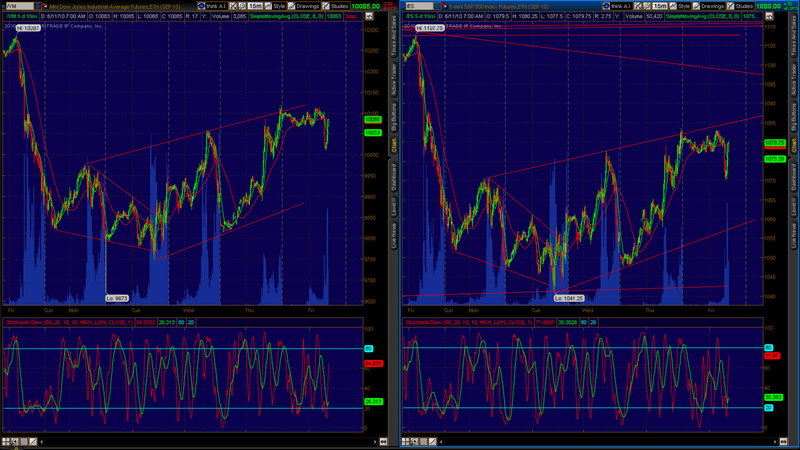 Below is a 15 minute chart showing the confines of the action over the past few days. We are now up against the downtrend line of this decline. 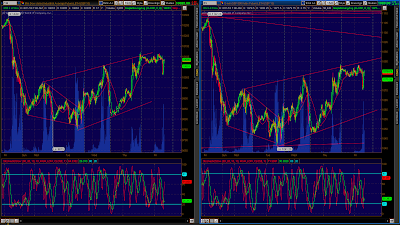 Breaking through the trendline may mean that a higher level correction is going to transpire. Keep an eye on the Dollar, the Euro, and on the VIX. The VIX has a support shelf at about 30, a move beneath that level may signal more upside, as would a break of the downtrend lines. Yesterday’s jump was not a natural or generic move, and once again it came on lower volume and without any change in any fundamental. It looks like a frantic fight between intervention and short covering on one side doing battle against the reality of gravity on the other. Very dangerous in both directions. If we break out after yesterday’s HFT romp, then the HFTs will be forced to pile on again and all the shorts will bail. That may lead us into a higher bounce and the formation of that right shoulder, we’ll see, but if you are not a speculator, this type of “investment” should not be for you. Hey, all I can say is hang on. The stuff that’s happening in the Gulf by our government and by BP is absurd and also very dangerous. People are doing desperate things - they are manipulating data, currencies, and markets. They are lying. History will look upon this time as a great example of how to destroy confidence. Hey, 50% increase in exports… 451,000 jobs created last month… it’s only leaking 5,000 barrels a day… subprime housing is contained… all I can say is that someone is smoking something good.